This holiday season, spending is projected to climb upwards of $720 billion, that is a projected 5% increase over 2017 holiday retail sales. We have analyzed consumer spending habits and holiday shopping patterns so you can capitalize on the expected holiday growth. The ten busiest shopping days are critical for retailers, accounting for nearly 45% of traffic for the holiday season. Black Friday still reigns in as #1; however, it is important to plan around the all of the high traffic times. 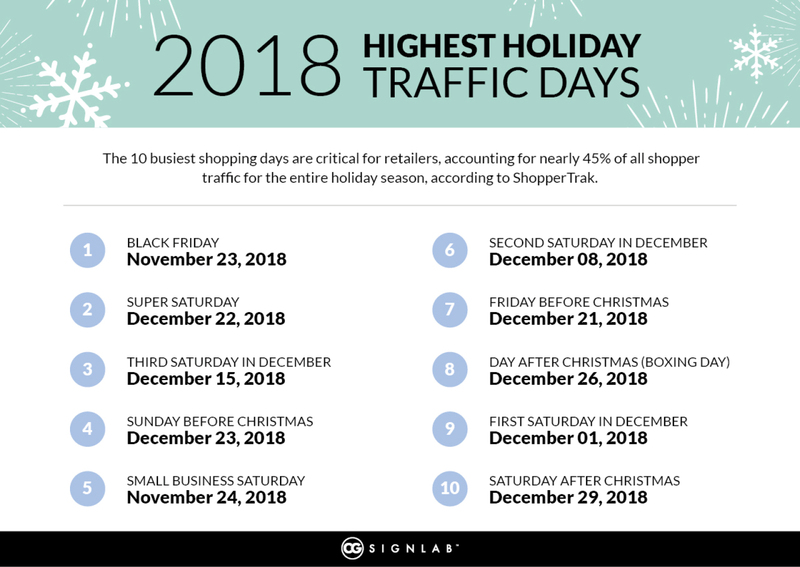 See below for the predicted top traffic days for 2018 Holiday Season. In addition to the top 10 predicted traffic days, there are three general phases of holiday shopping . Phase 1 runs from early November through Cyber Monday. This period is when stores are most likely to see big-ticket purchases and higher cart values, making this the perfect window for your best traffic-driving promotions. Phase 2 happens in the first two weeks of December when most holidays shoppers are finishing their shopping and will typically purchase more stocking stuffers, gifts for co-workers, and impulse items. The final stage takes place the week before Christmas when all the procrastinators finally get out to shop and spending peaks. Use the top traffic dates and phases to anchor your preparation. Create a promotional calendar that coincides with the Top 10 Traffic Days. Also, consider hiring extra seasonal staff to keep your operations and customer service running smoothly through the increased customer traffic. You should already have some excess inventory cushion of your top-selling items for heavier traffic days but will still need to create a contingency plan if you run out-of-stock. For example, can you offer direct shipping to the customer instead? Can you have it gift wrapped and shipped directly for a small additional fee? Do the math ahead of time to figure out what services you’re able to provide to save the customer time and keep their business. Take some of the stress out of the holiday season, download the 2018 Holiday Marketing Checklist. Friendly environments draw people into the front door and encourage spending. When consumers feel that a store has a positive atmosphere, they tend to stay longer, which can lead to a higher conversion rate. From the friendliness of customer service to the look and feel of your space, various details impact the atmosphere of any retail location. Pay extra close attention to aspects that affect your store environment during the holiday rush. 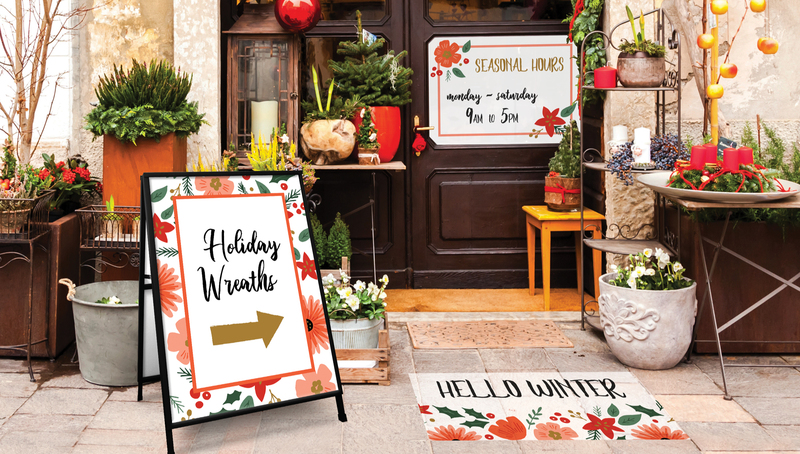 The addition of an inviting, holiday-themed sidewalk sign or outdoor floor graphic will grab the attention of passing traffic. However, your holiday theme should extend throughout your entire space. Grab some holiday decor to make your window display festive and enticing. Use holiday colors to design holiday-themed window clings and floor graphics. Create a holiday-curated playlist to enhance the shopping experience and put your shoppers in the gift-giving mood. You can add to the customer experience further by involving scent. Did you know that we are 100% more likely to remember something that we smell than see, touch or feel? Play to this detail in your retail store with a candle or other scented plug-ins. For the holiday season, lean toward scents of fresh pine, baked cookies, spiced cider and other fragrances that are reminiscent of everyday holiday activities. Once customers set foot in your store, do not make them hunt. 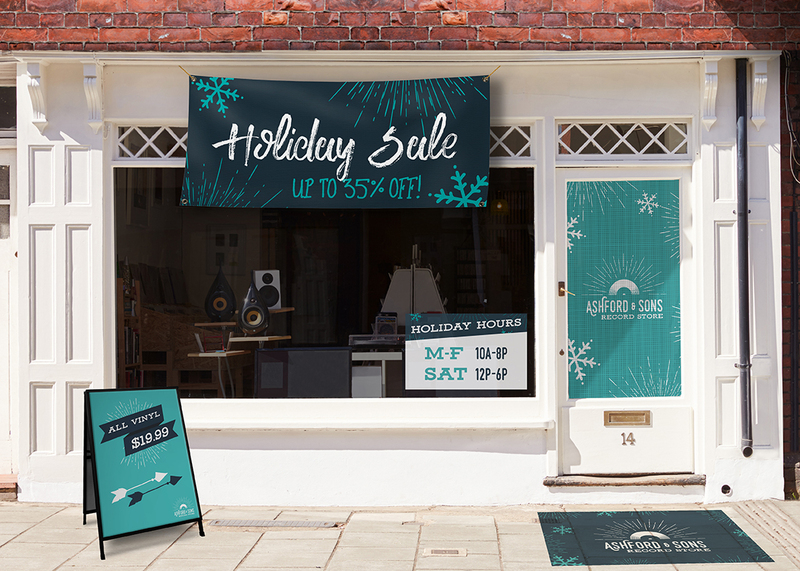 Promotions should be easy to find and clearly stated with signs, floor graphics, and banners. Merchandise critical products up front. Plan and organize your space to accommodate for increased foot traffic, including signage that uses space well. Download and print the Holiday Retail Checklist for a quick guide to successful Holiday Signage. Before writing off digital marketing planning, you should know that “retailers have a 59 percent likelihood of converting a smartphone shopper to a purchaser and a 75 percent chance of converting a desktop or laptop shopper.” Even consumers who buy from you in-store rather than online still want a cohesive branding experience when they head online. Many people browse online to make digital price comparisons before committing to an in-store purchase. Cover your basics by making sure that your logo looks cohesive on your social media accounts and website as well as your storefront. Apps like Adobe Spark and Canva also allow users with limited design experience to create beautiful images and logos quickly. Social media is a great place to promote the offers you intend to run, as well as educate your audience about any special holiday hours you may hold. For more details, refer to the digital section of our Holiday Marketing Checklist. While many consumers are looking for gifts during the holiday season, they are also more inclined to shop for themselves. In 2017, 44% of holiday shoppers reported that they waited until the seasonal sales rolled around to purchase more significant ticket items for themselves or their households. Ensuring your business is ready for personal and gift-giving shoppers will help capture more sales.